Asked to choose your favourite British radio DJs the chances are one of them will be on this list: David Jacobs, Alan Freeman, John Peel, Tommy Vance and Roger Scott. All now sadly no longer with us. 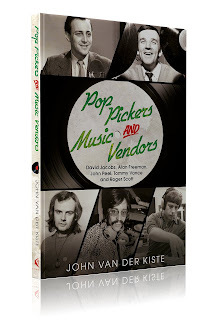 But all are the subject of this latest book, Pop Pickers and Music Vendors by John Van der Kiste. Aside from Peel - who must surely be the most written about DJ, with Kenny Everett running a close second - the rest of John's cast of players have not received the same level of attention, at least not in printed form. There is much here to satisfy the casual reader as there is the ardent radio enthusiast. Pop Pickers and Music Vendors is published by Fonthill Media and is available from them and all the usual places. One for the Christmas book list I think.